Another vegetarian recipe?! I know, it’s getting out of hand. But seriously you need to try this one out, it will change the way you see the humble little aubergine forever, I promise. I love the way aubergines are meaty enough to hold up as the main part of a meal. 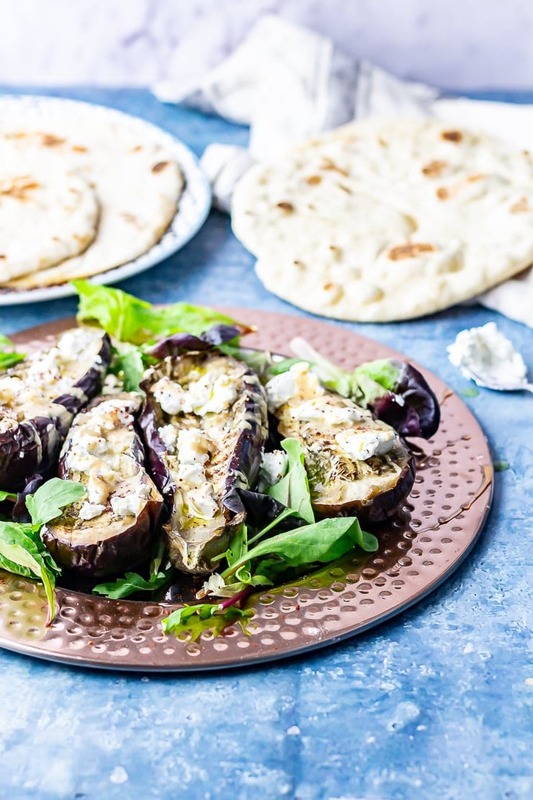 I’ve made roasted aubergines before with a satay sauce and I always thought that couldn’t be beaten until I made this baked aubergine with tahini and goat’s cheese. We have had the most lovely weekend. For my birthday a few months ago Will bought me a night away in Bristol for this weekend so I took Friday off work and we caught the coach over to Bristol. I’ve been there once before but it was for my sister’s hen do so we didn’t get to see much of the city but this time Will and I spent Friday eating and drinking (of course) and then all day Saturday wandering around the city and falling in love with it. Will’s basically decided we’ll be moving there at some point over the next few years and I don’t totally hate the idea! We love living in London but we both feel like at some point the negatives of living here will outweigh the positives. It’s such an expensive city to live in and knowing that we could not only get somewhere to live but also our general cost of living for much less in a different city makes us feel like we might end up wanting to leave here eventually. Anyway, we also managed to meet up with an old friend who I was at college with and I haven’t seen in many years. 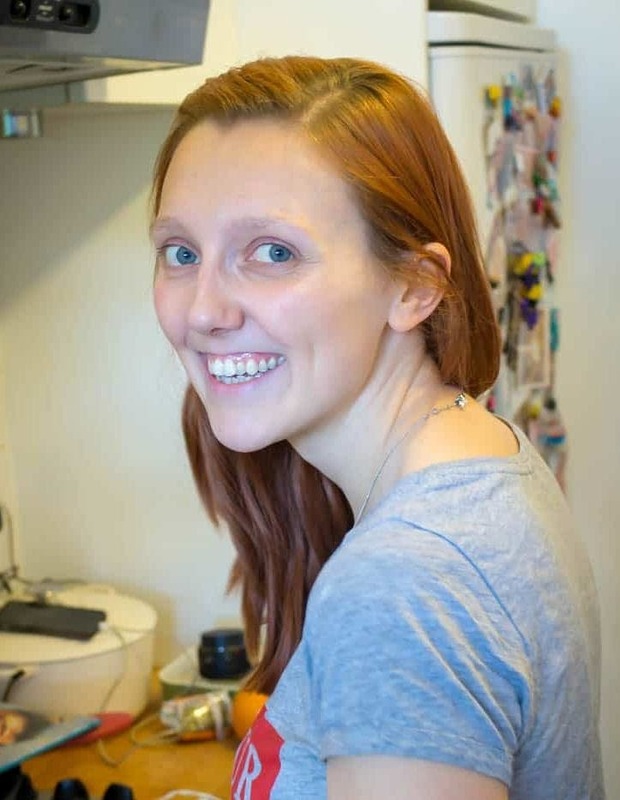 She used to live in Bristol and just happened to be visiting this weekend so it seemed too perfect not to meet up! We also ate some delicious food while we were there including a massive burger which had brie and caramelised onions on it (!) and an incredible halloumi wrap which we bought at the market on Saturday afternoon. All in all a brilliant 2 days in Bristol. 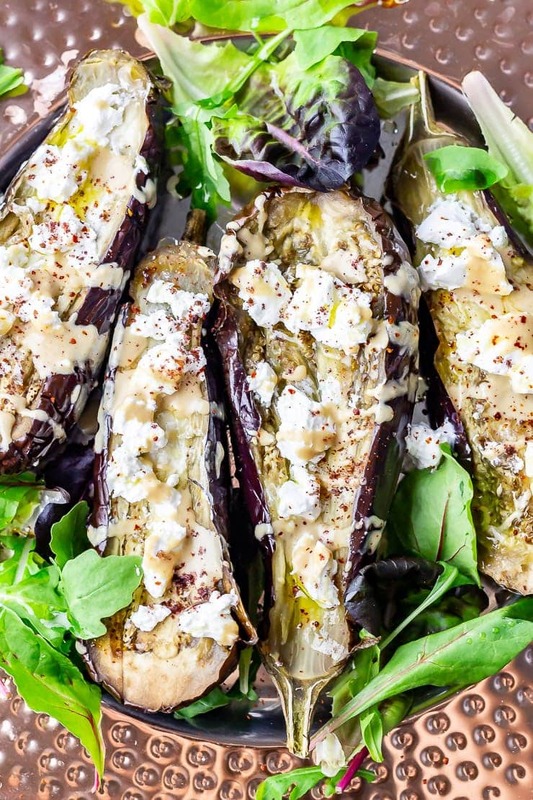 So let’s talk about this baked aubergine recipe shall we? It’s one of those recipes that’s so simple and really lets the ingredients shine. I started by baking the aubergines whole in the oven for about 45 minutes until the flesh is soft and tender. This is one of my favourite ways to cook aubergine and it’s so easy. If you want a summery no oven way to make this recipe then simply wrap them up in some foil and pop on the barbecue until they’re cooked through. 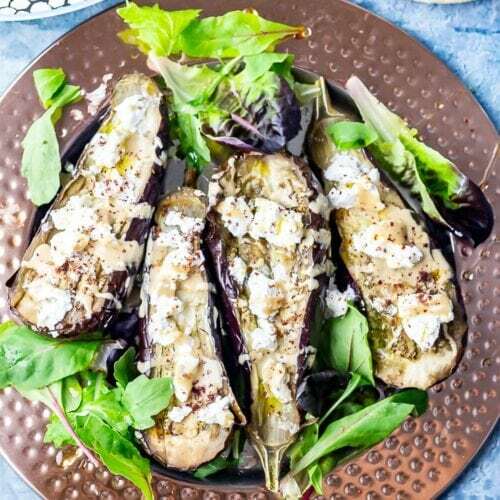 Once the aubergines roasted and are all soft and ready to eat you simply split in half lengthways and scatter over the rest of your ingredients. I started off with a big old drizzle of olive oil because there’s nothing better, really. After that it’s tahini, goat’s cheese, sumac and a few chilli flakes if you fancy it. There’s something about the simplicity of this recipe which makes each ingredient shine and work perfectly together. 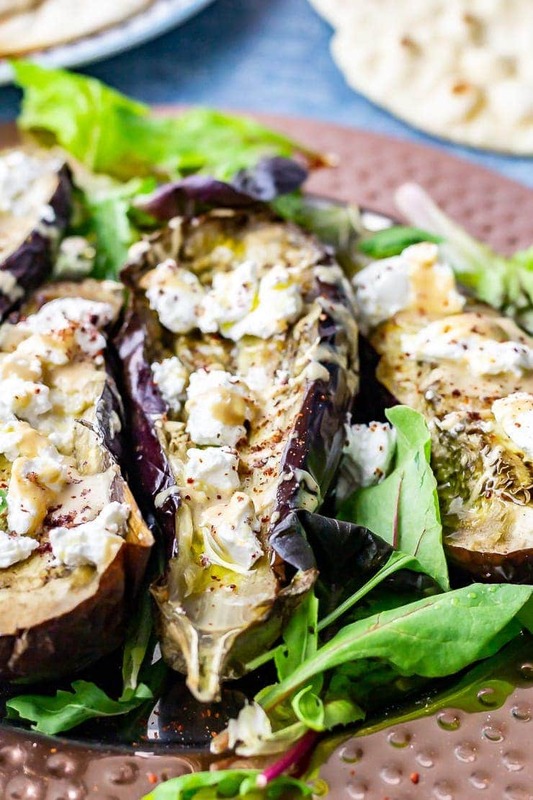 It’s just one of the best aubergine recipes! 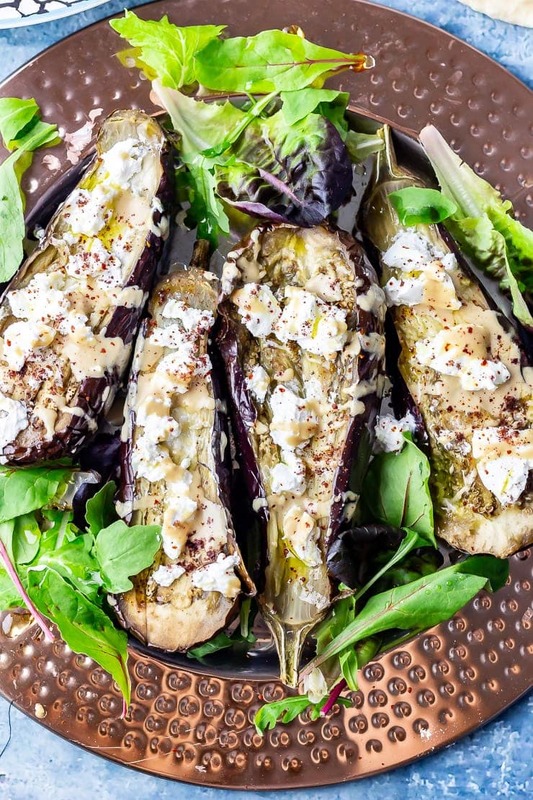 What to serve with baked aubergine? There are so many ways you could serve this dish! 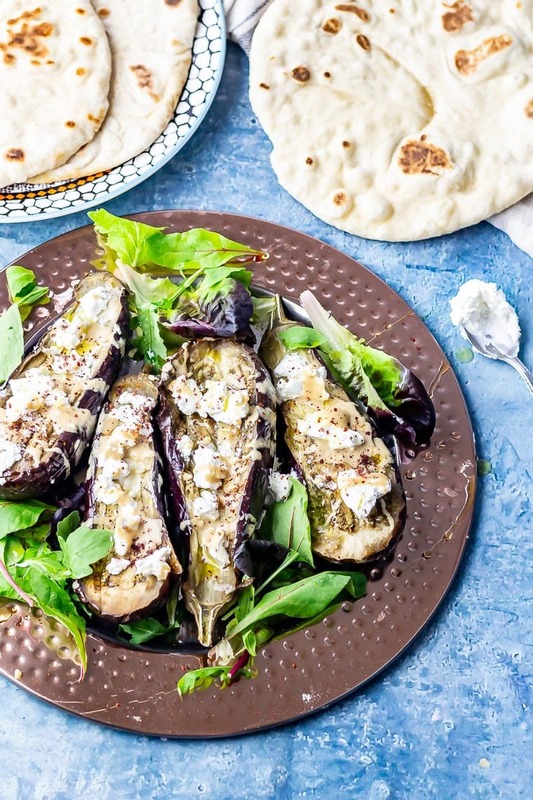 We served these baked aubergines as a simple summer weeknight dinner with some homemade flatbreads on the side and it was one of my favourite dinners for a while. 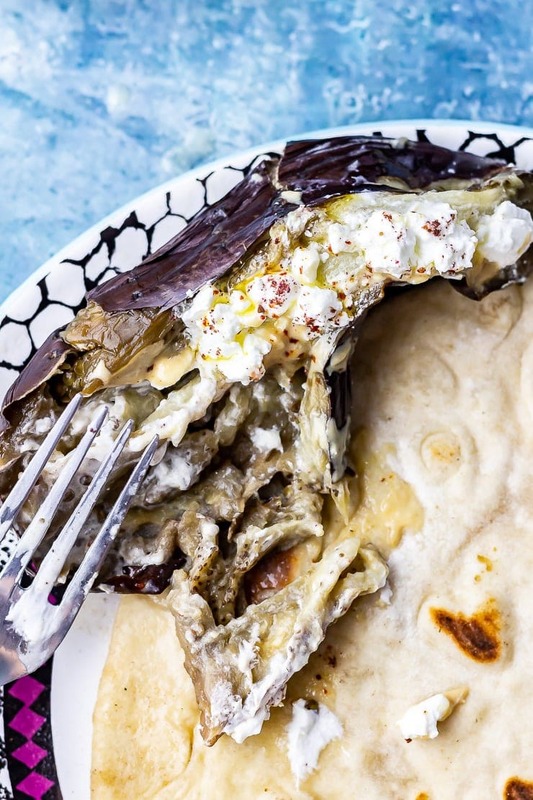 The aubergine flesh gets so soft when it’s baked you can scoop up aubergine into the flatbreads along with all the toppings with a few lettuce leaves and maybe a little hot sauce and it’s just the best. Alternatively you could add a grain of your choice, couscous would work well. 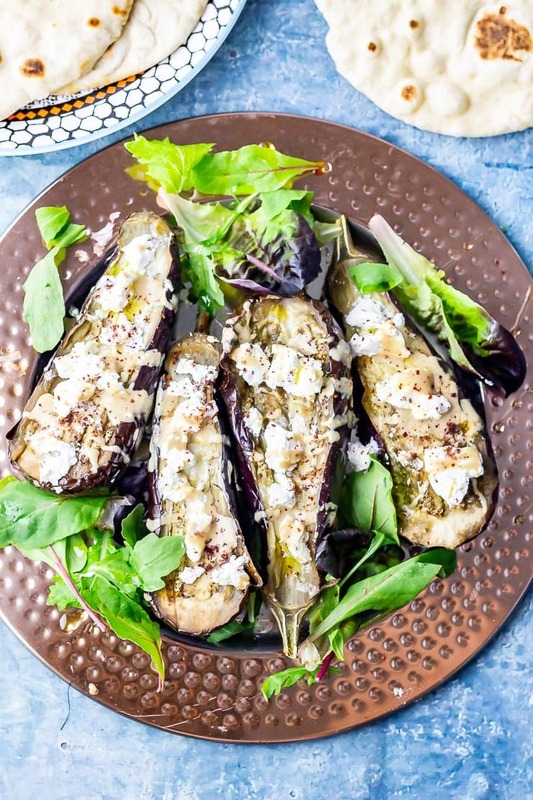 This baked aubergine recipe is so easy to make and yet is impressive enough for a dinner party. 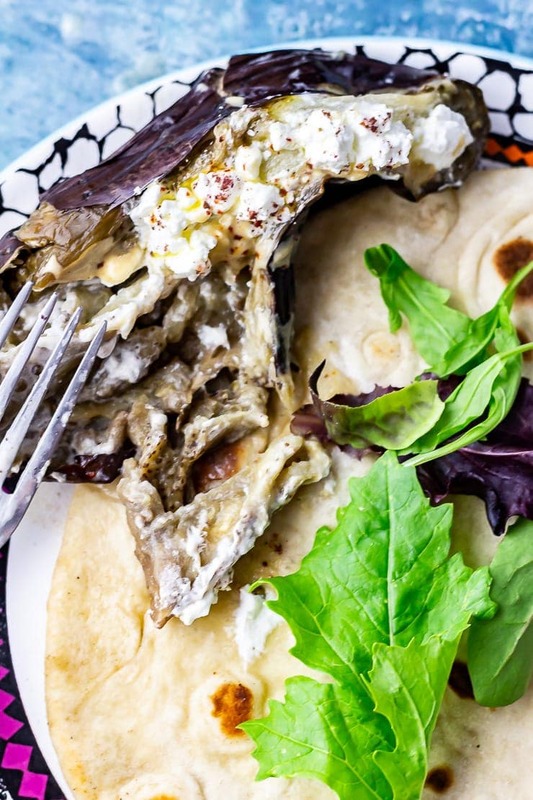 Just a few ingredients like tahini, goat's cheese and olive oil make this an incredible meal. Pre-heat the oven to 190°C and roast the aubergines for 45 minutes-1 hour. Remove from the oven when a skewer passes all the way through easily. 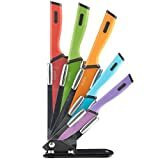 Cut the aubergines in half lengthways and open. Drizzle with olive oil then add spoonfuls of goat's cheese and tahini and sprinkle over sumac and chilli flakes. This looks outstanding Amy! I love eggplant, but have never prepared it like this before. Love the addition of the goat cheese and tahini. How yummy! 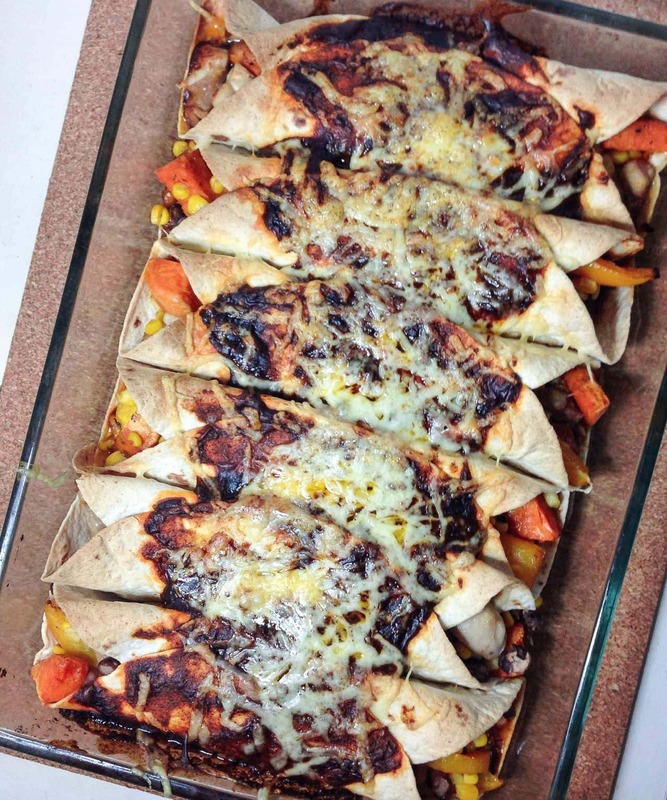 Thanks for sharing other ways to use the baked aubergine for leftover dishes. I love when recipes include this. This is mouthwatering. I am in for vegetarian recipes always! I also love that you mention being able to cook this on the grill as I have no kitchen whatsoever right now! this dish looks fabulous I just love the tahini with cheese in this sounds over the top yummy. I am printing it!